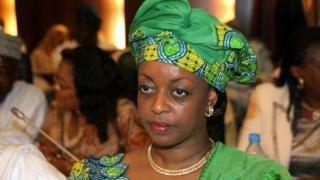 Nigeria's former oil minister Diezani Alison-Madueke has been arrested in London, her family has said. She is believed to be one of five people the UK National Crime Agency said it had arrested, but did not name, as part of an investigation into suspected bribery and money laundering. Ms Alison-Madueke was oil minister between 2010 and 2015. She denied wrongdoing when it was alleged that $20bn of oil money had gone missing when she was in office. That accusation was made by Nigeria's central bank governor Sanusi Lamido Sanusi in February 2014. Mr Sanusi was sacked soon after, accused of financial recklessness himself. But it was one of a number of corruption allegations that dogged the presidency of Goodluck Jonathan, in whose administration Ms Alison-Madueke served. The National Crime Agency said on its website only that its "recently formed International Corruption Unit has arrested five people across London as part of an investigation into suspected bribery and money laundering offences". The identities and nationalities of these people were not disclosed, but family members of Mrs Diezani Alison-Madueke confirmed that she had been arrested in London, Mansur Liman, editor of the BBC's Hausa Service, reports. Recently, new Nigerian President Muhammadu Buhari vowed to trace and recover what he called the "mindboggling" sums that have been stolen from the oil sector. He also promised to prosecute those responsible.